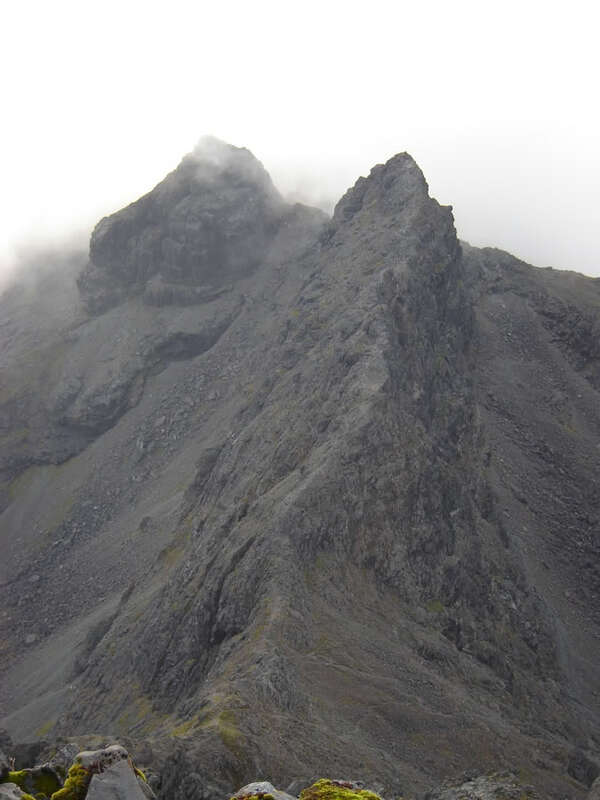 Above photo subsequently used in SMC Cuillin guidebook as topo pic. 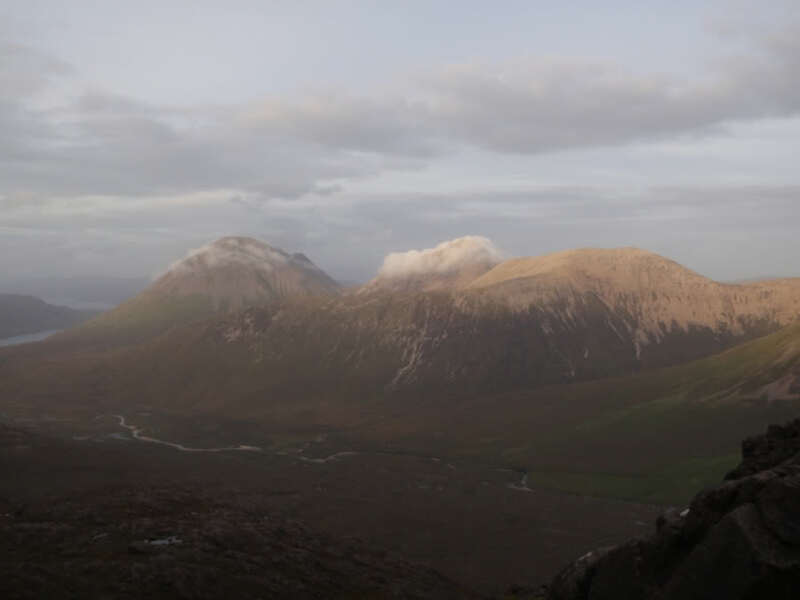 In advance of a weekend meet to Torridon, myself and Adrian agreed to meet up at the Sligachan bunkhouse with a view to undertaking something 'interesting' on Skye. On Wednesday evening we agreed good and bad weather plans. 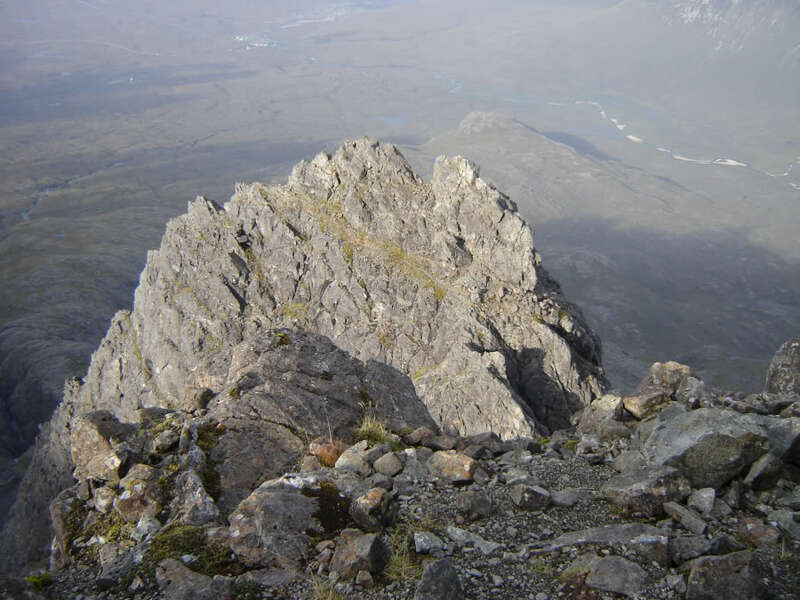 Good weather plan: an ascent of Sgurr nan Gillean via Pinnacle Ridge. 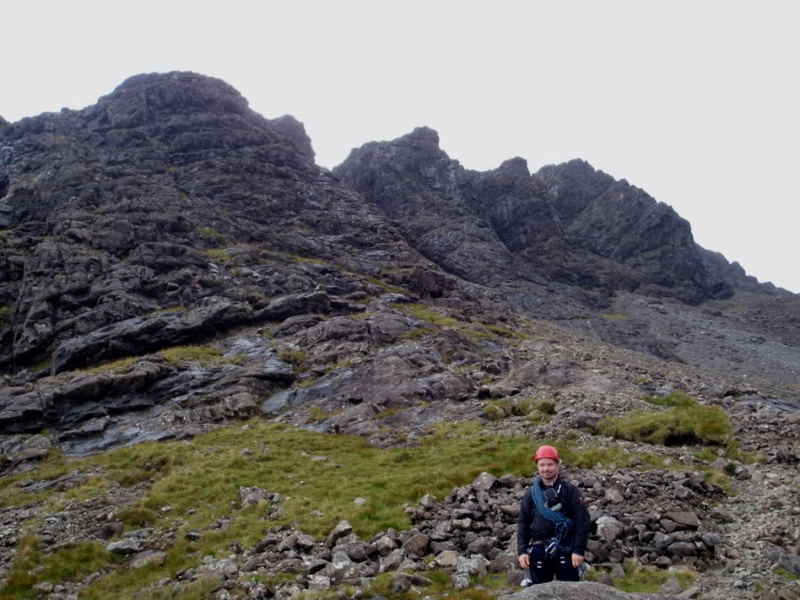 Bad weather plan: an ascent of three Grahams near Kyleakin. 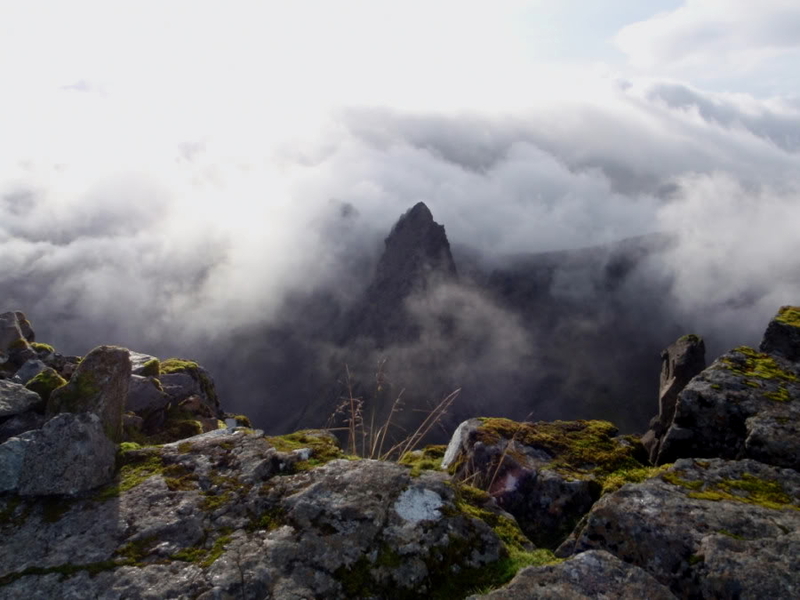 The Wednesday evening MWIS forecast was reasonable: minimal wind, no rain but low cloud. 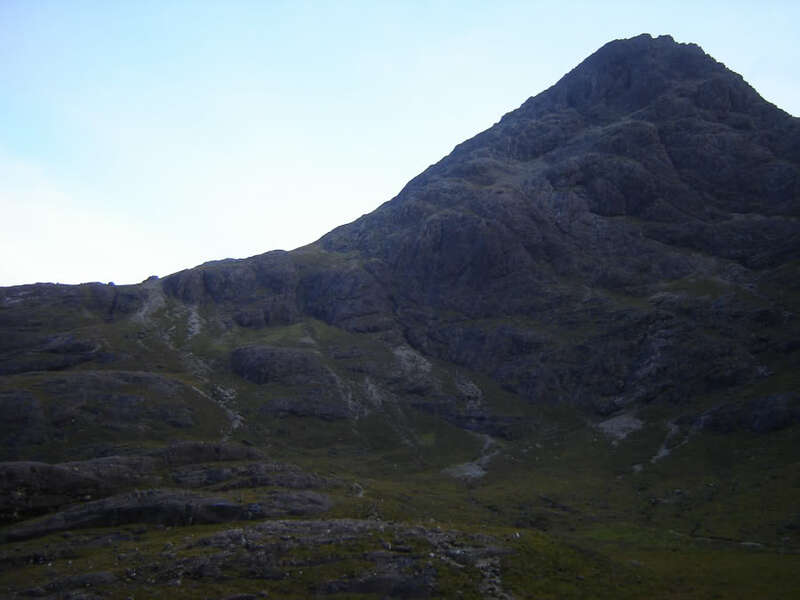 On looking out the bunkhouse window on Thursday morning, we could see the top of Sgurr nan Gillean. Superb, good weather plan was on. 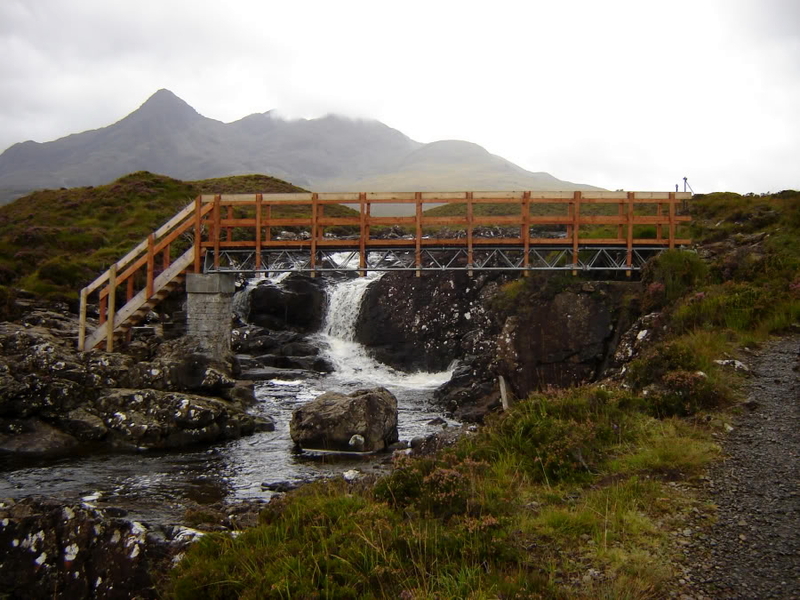 After some breakfast, we set off walking from the bunkhouse and before long reached the nice new bridge over the Allt Dearg Mhor. 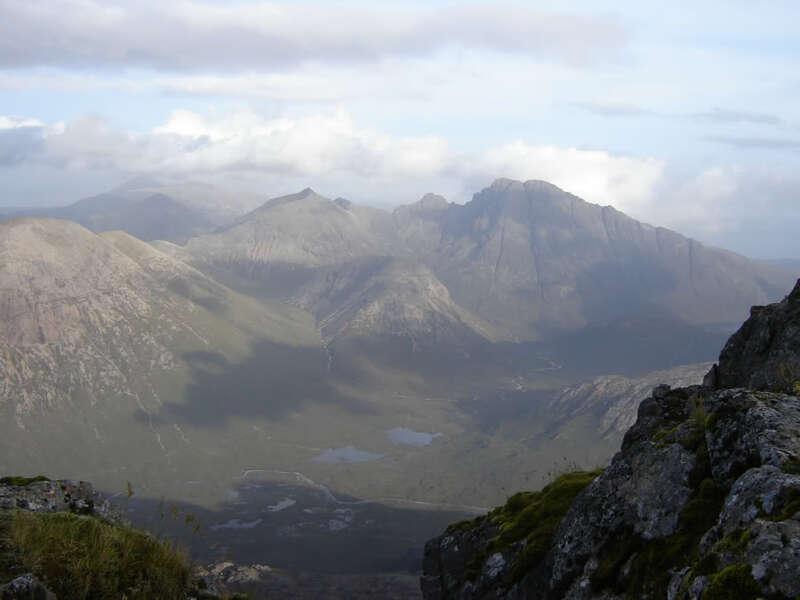 After crossing the bridge, we continued to follow the path towards the Northern Cuillin. 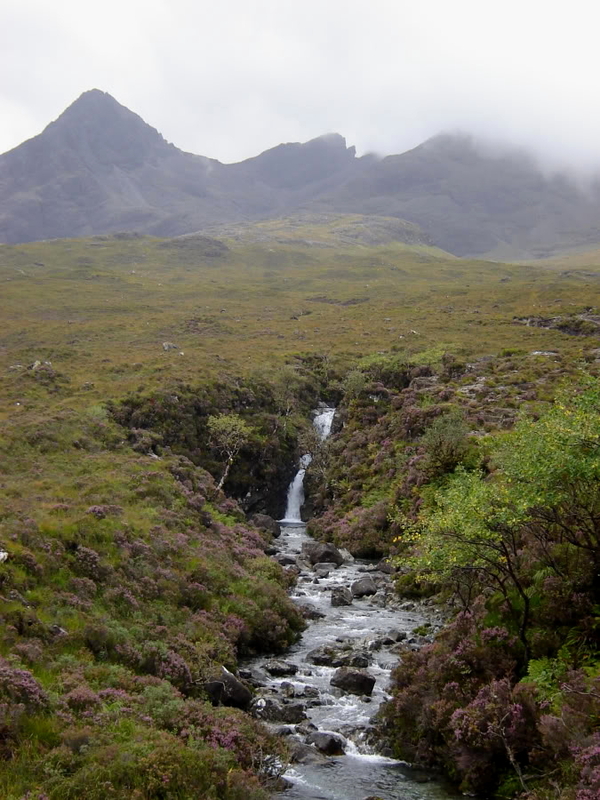 After c.1.5km we reached the Allt Dearg Beag which has some waterfalls and impressive blue-coloured pools with lots of rounded pebbles. 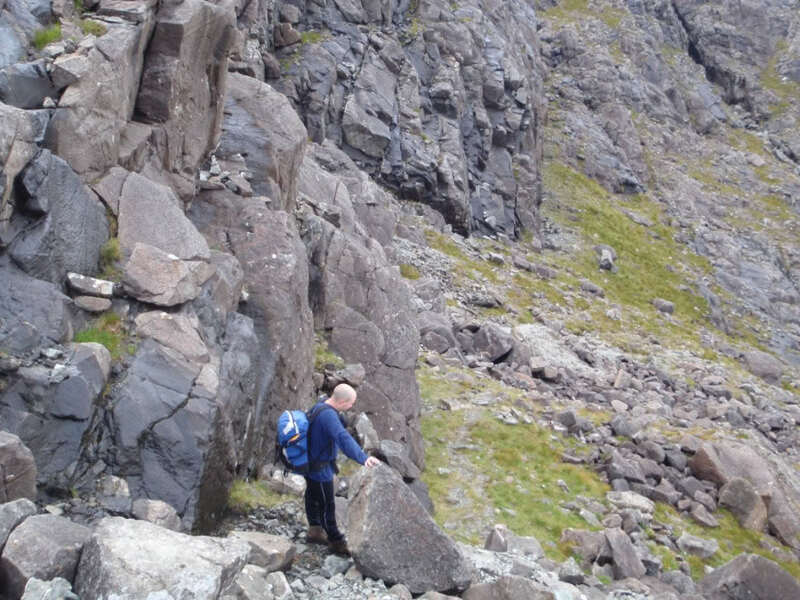 We crossed the planks over the Allt Dearg Beag and continued on until reaching the patch of oval stones that marks the split between the Tourist Route and the route towards Pinnacle Ridge and Bealach a’ Bhasteir. 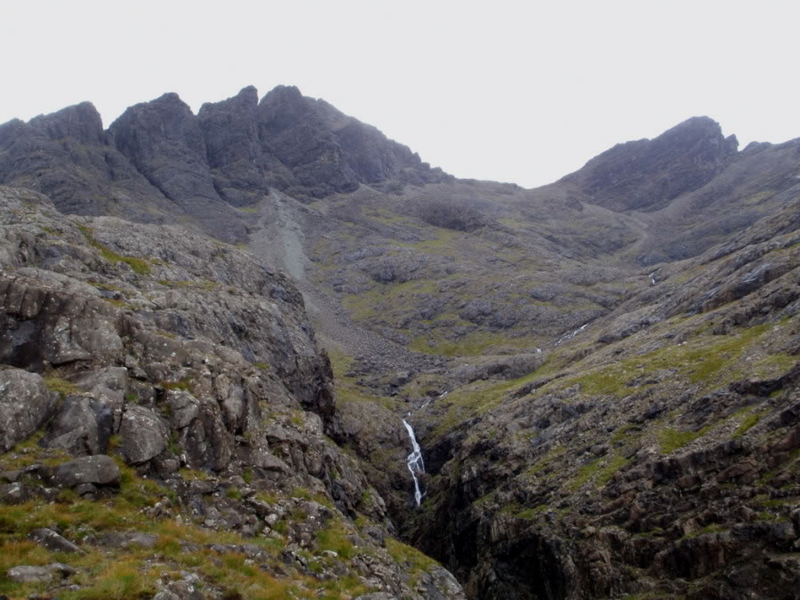 We then followed the path towards the base of Pinnacle ridge, alongside the Allt Dearg Beag and then the Bhastier gorge. 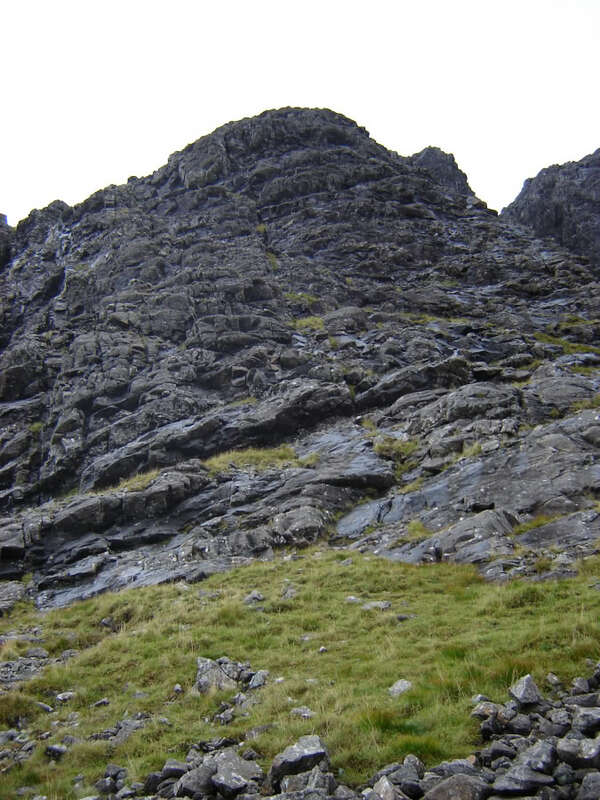 Until now, Pinnacle ridge was pretty-much hidden from view. At last we started to get views of what was still to come. 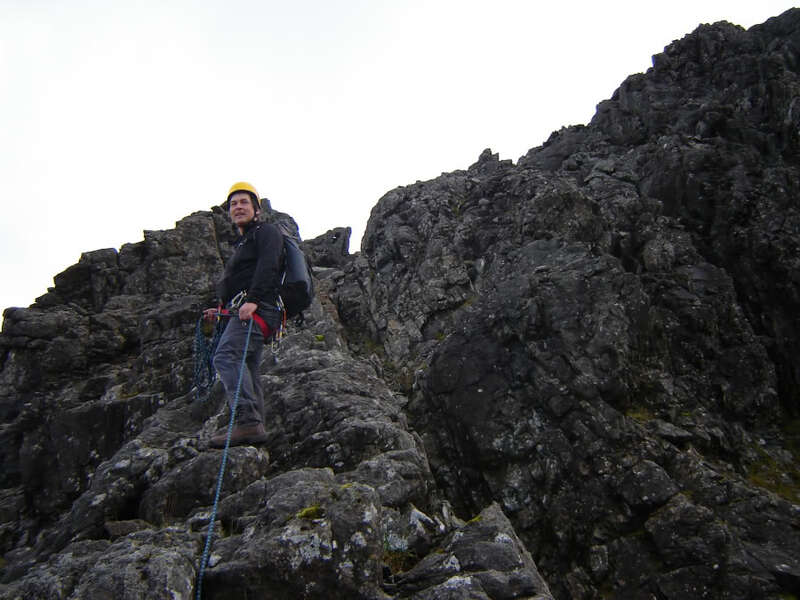 We reached the base of Pinnacle ridge two hours subsequent to setting off. 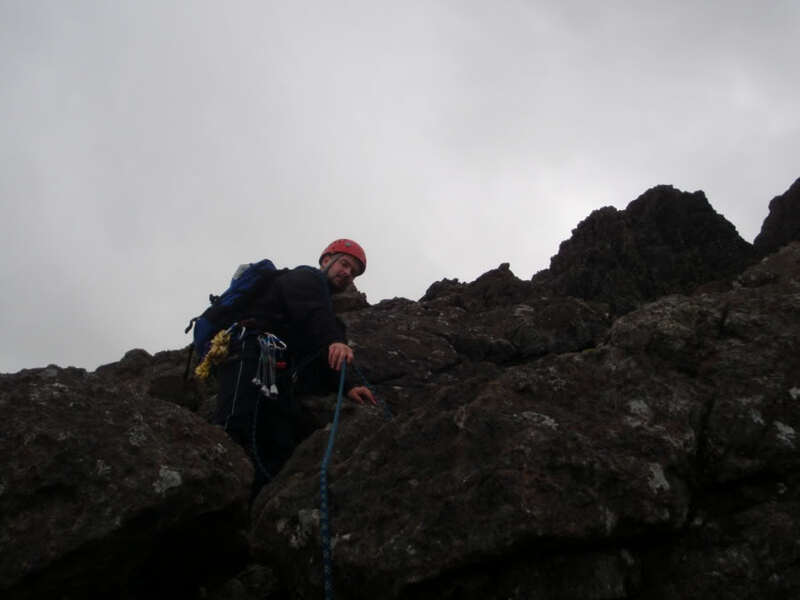 At the base of the ridge we geared-up with harnesses, helmets and a minimal climbing rack. 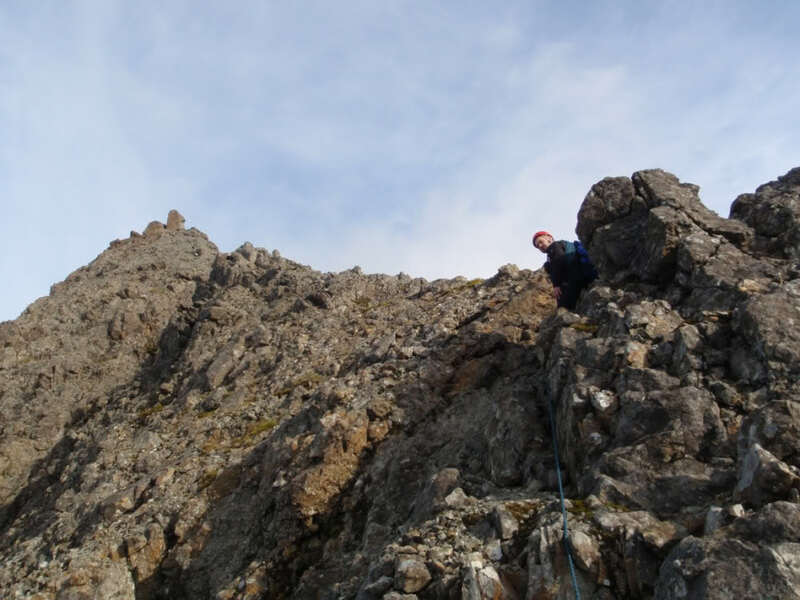 We decided to short-rope as much of the ascent as possible only pitching where the guidebook suggested the grade was Moderate or Diff. Adrian set off in front. 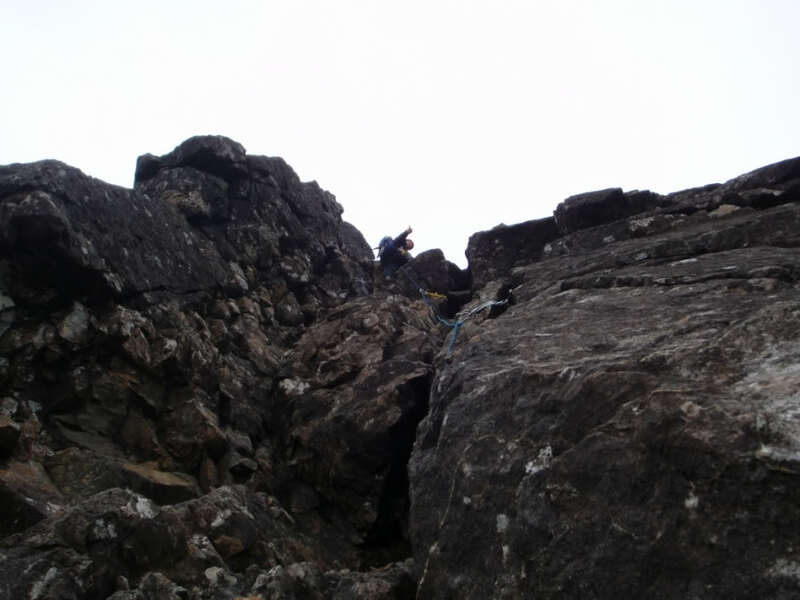 The initial scrambling was straight-forward apart from having to avoid various wet sections. 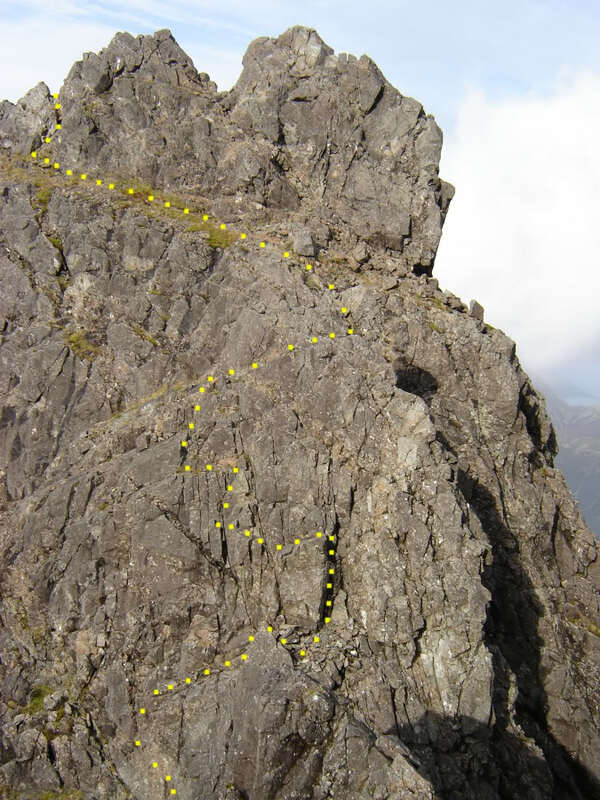 There was no need to refer to the guidebook for the ascent of the first pinnacle, it was pretty-much just follow the route that looked best. 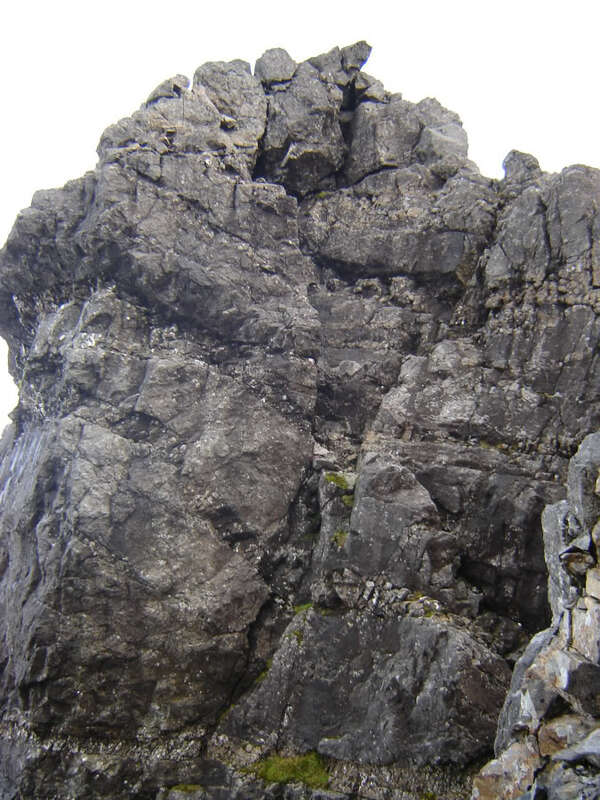 It didn’t take long to reach the top of the first pinnacle and I was quite surprised at how easy the going was up the second pinnacle; basically just a walk. 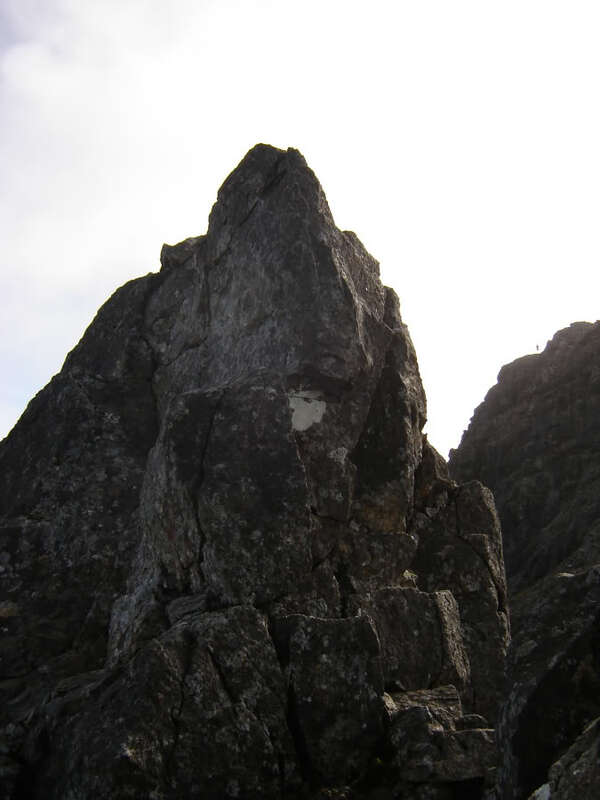 Before long we were at the top of the second pinnacle and onto the ascent of the third pinnacle. Very easy thus far but things were about to get a little bit harder. 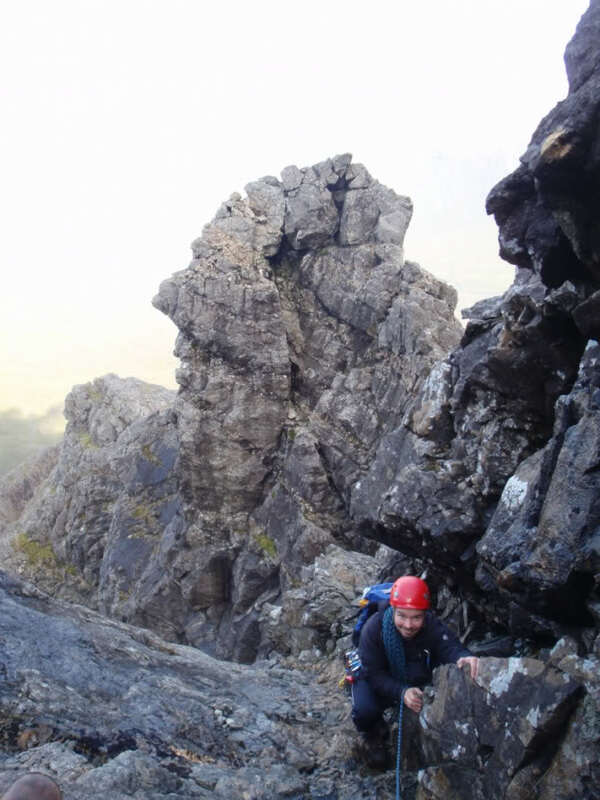 The guidebook suggested that the steep groove on the third pinnacle was Moderate, so we decided to use the climbing gear for the first time and pitched the ascent of the groove to reach the top of the third pinnacle. As the book describes there is really only one awkward move. 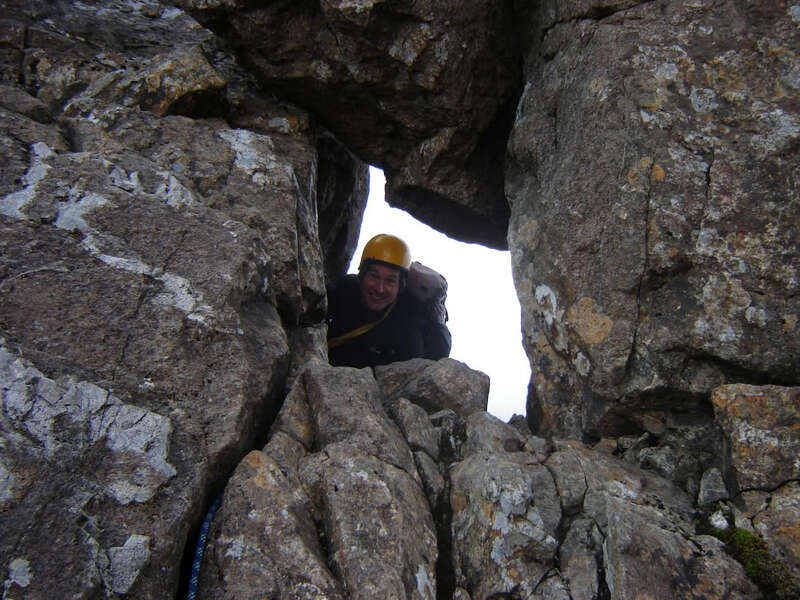 On reaching the top of the third pinnacle, it was time for what the guidebook described as a ‘scary abseil’. 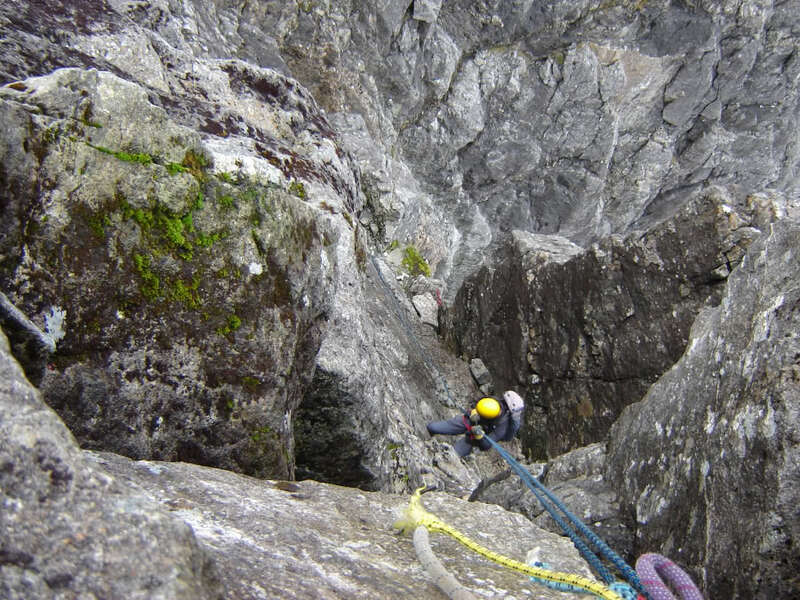 We fed the rope through about six pieces of tat, tied a knot in the end of the doubled rope to prevent potentially abseiling off the end of it and chucked the rope over the abyss. 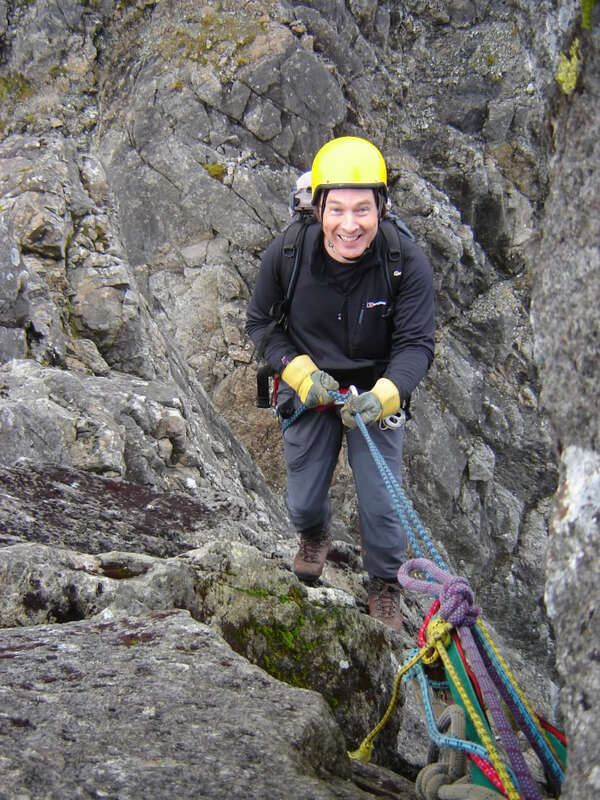 The abseil wasn’t simple. 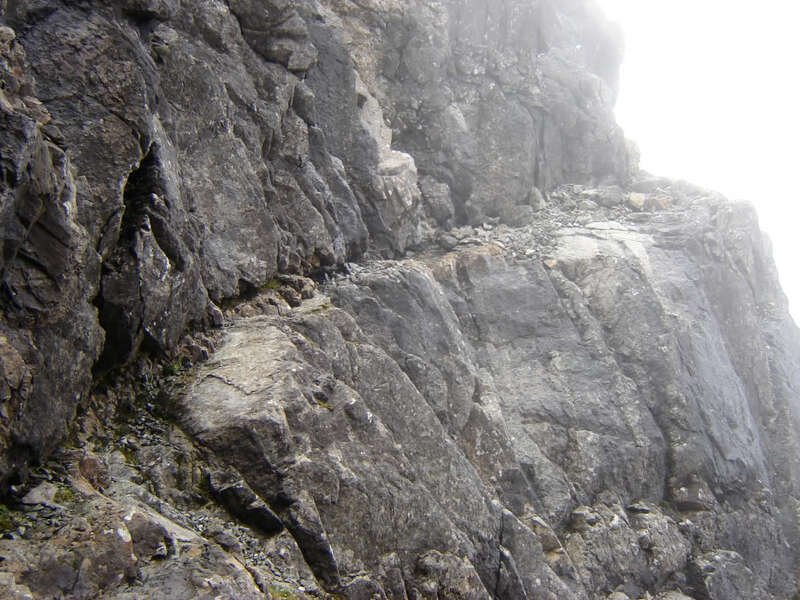 The beginning was over-hanging and we couldn’t really see the bottom ledge/gap. 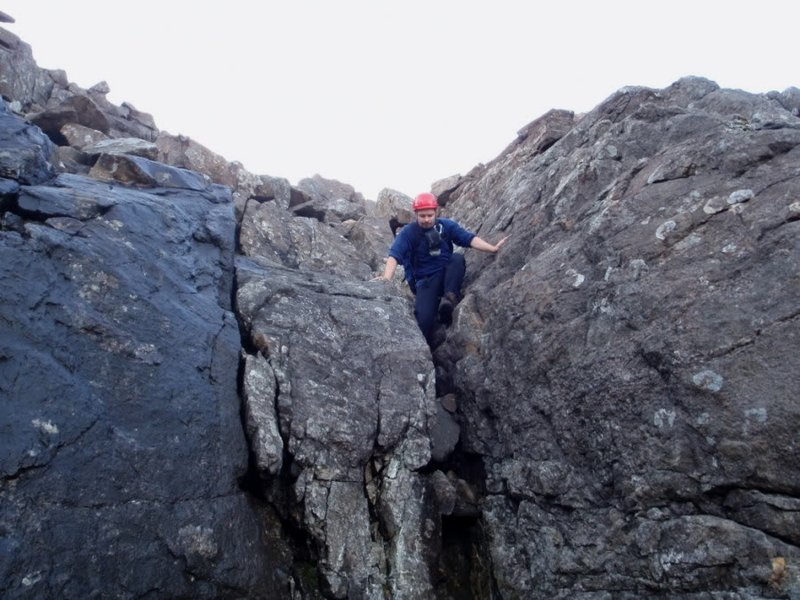 Adrian set off abseiling first to the ledge 22m below. 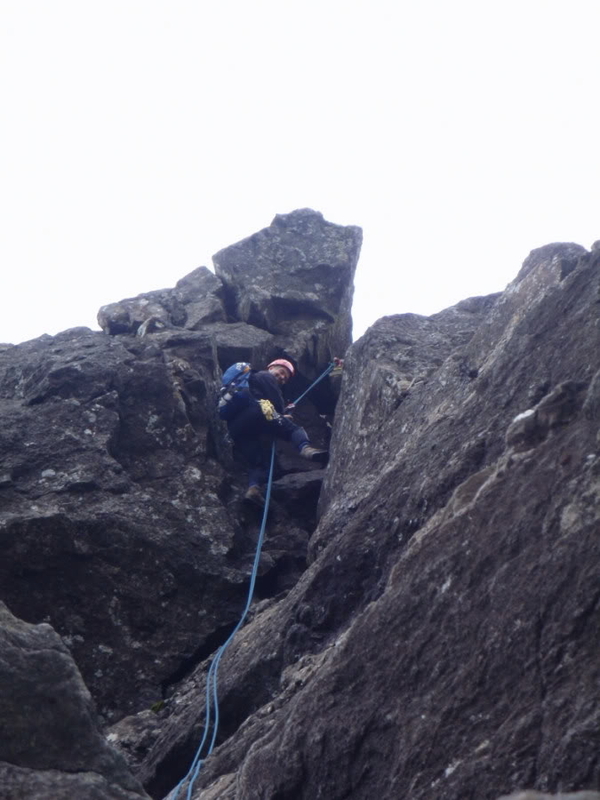 I also then abseiled to the ledge but continued-on abseiling down to the gap a further 5-6m below. It was handy having a 55m rope. On reaching the gap between the third pinnacle and the fourth pinnacle (Knight’s Peak) we took coils again and set off short-roping. 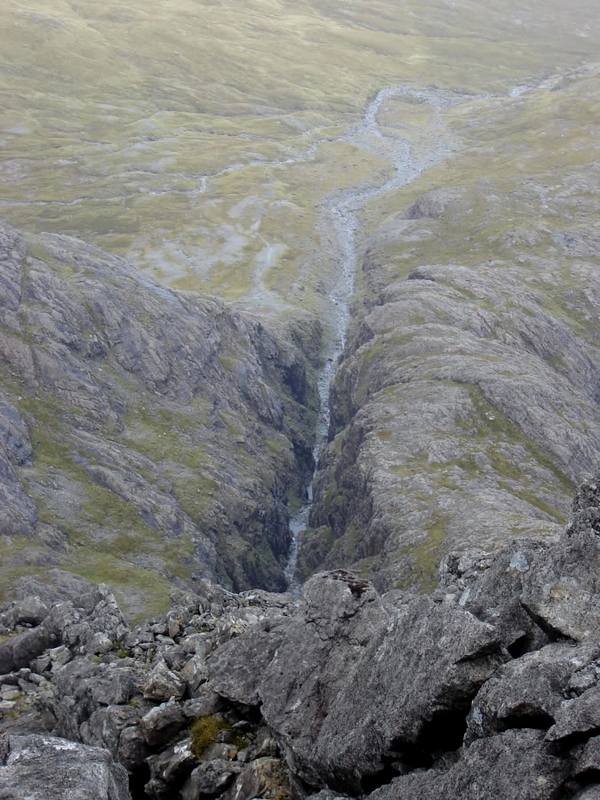 We initially followed the obvious, but precarious, ledge leading right and round the corner. 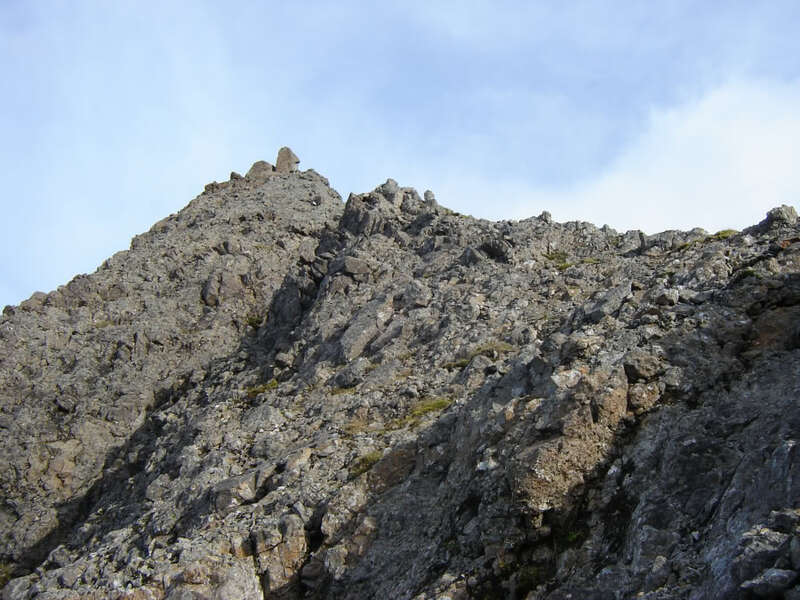 Next we ascended Knight’s Peak eventually reaching its twin tops. 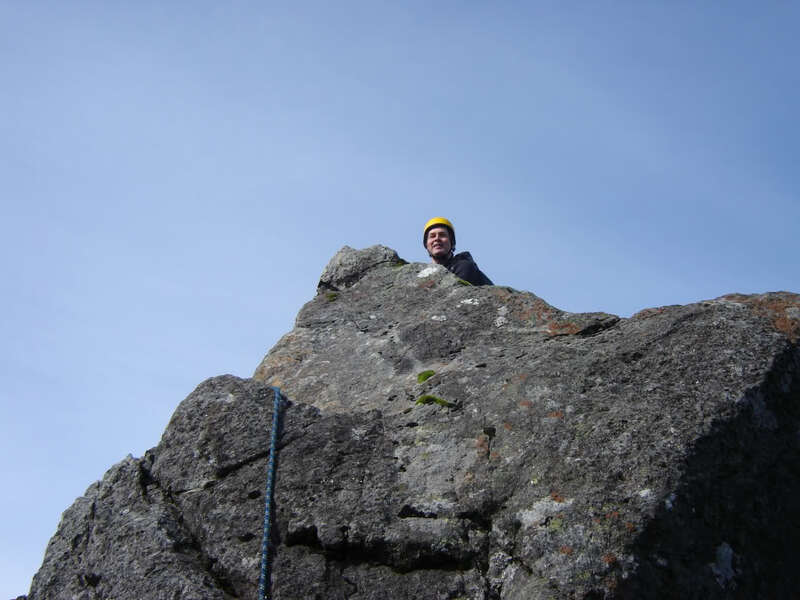 Until now, apart from the abseil, everything was fairly easy. 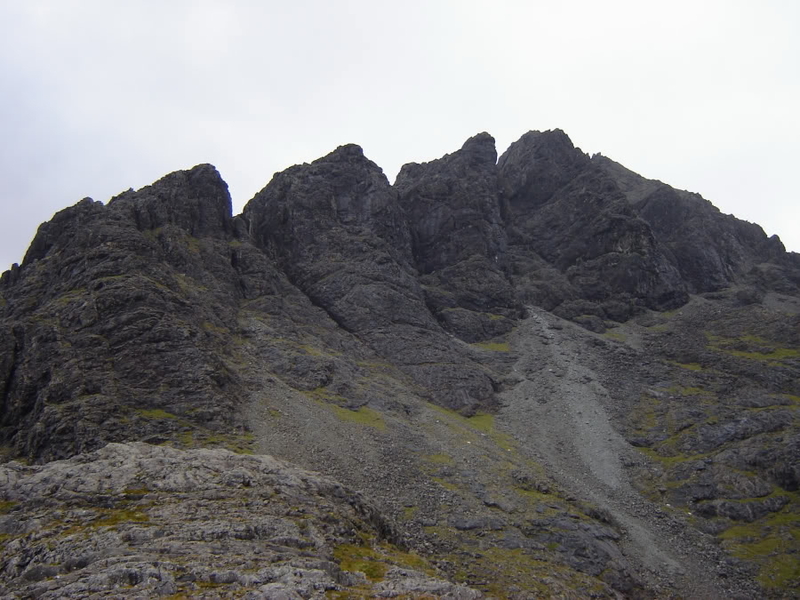 The descent from Knight’s Peak to the gap between it and Sgurr nan Gillean was definitely not so easy. 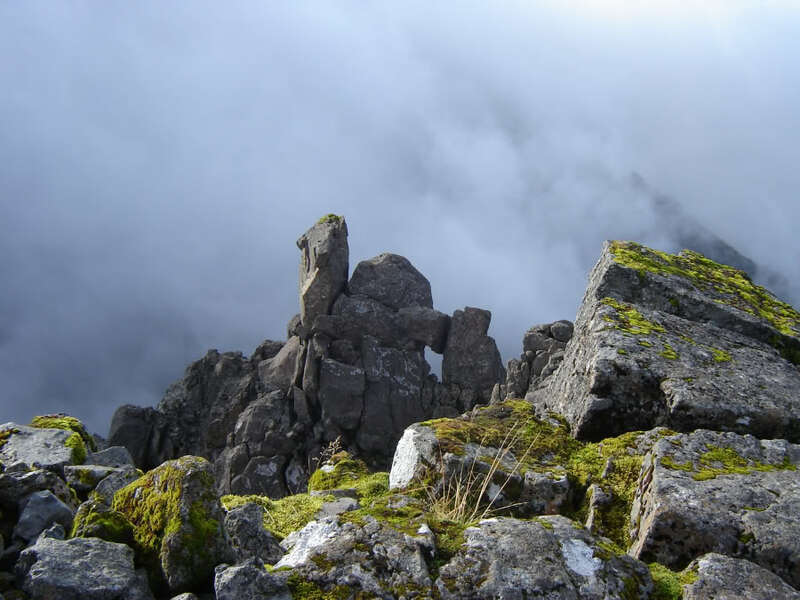 The guidebook states, “The descent from Knight’s Peak gives quite sustained scrambling and requires good route-finding.” This is correct on both counts. 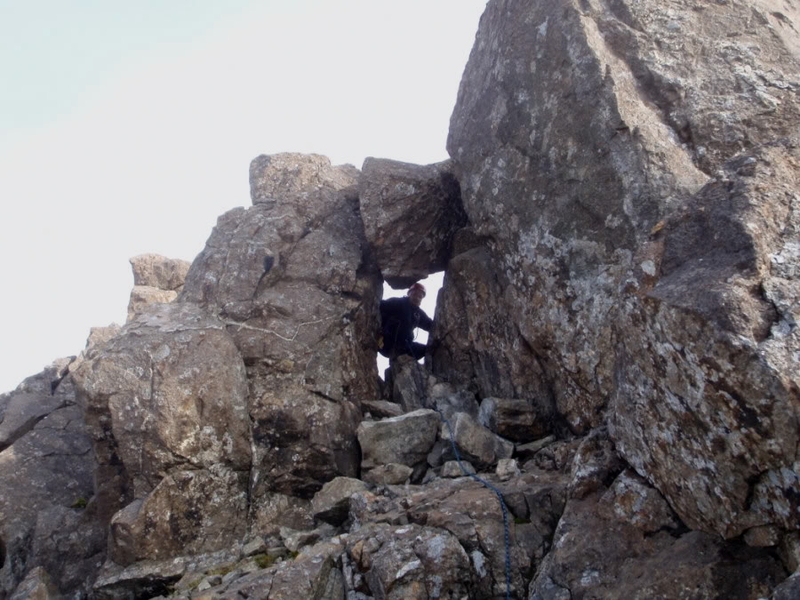 We spent significant time here searching for the right way off and when we found it, decided to pitch some of the descent by putting in gear to protect the second. 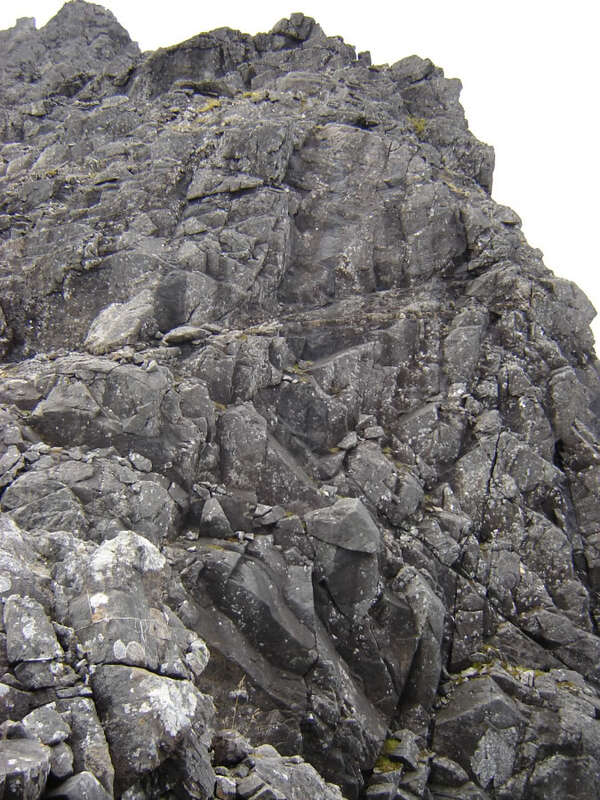 The descent includes a 5m Diff chimney with a considerable drop still below it. 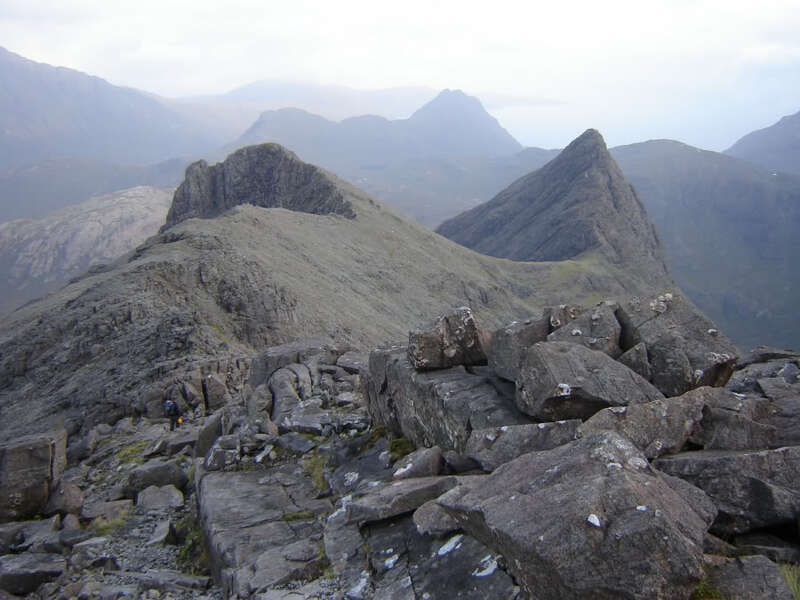 Between Knight’s Peak and Sgurr nan Gillean there is a minor pinnacle that is passed on the right. 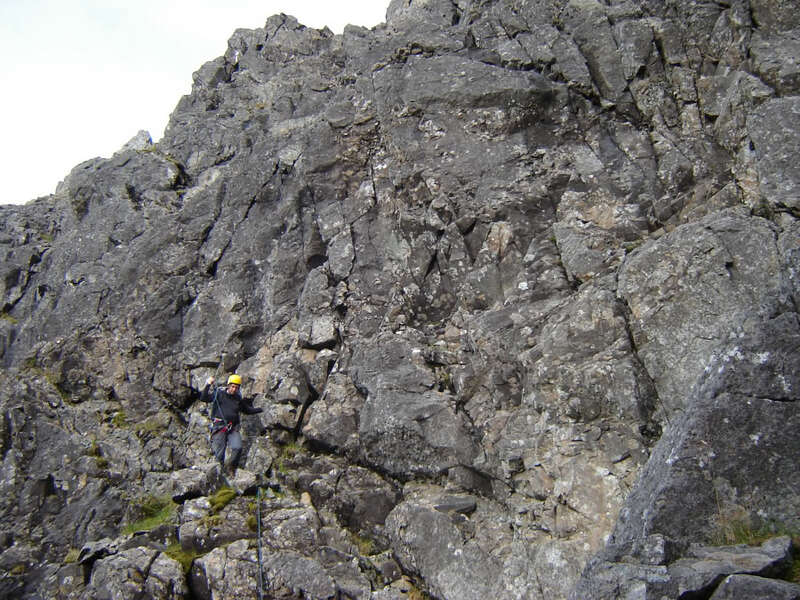 ... and finally, the ascent of the final pinnacle, Sgurr nan Gillean. 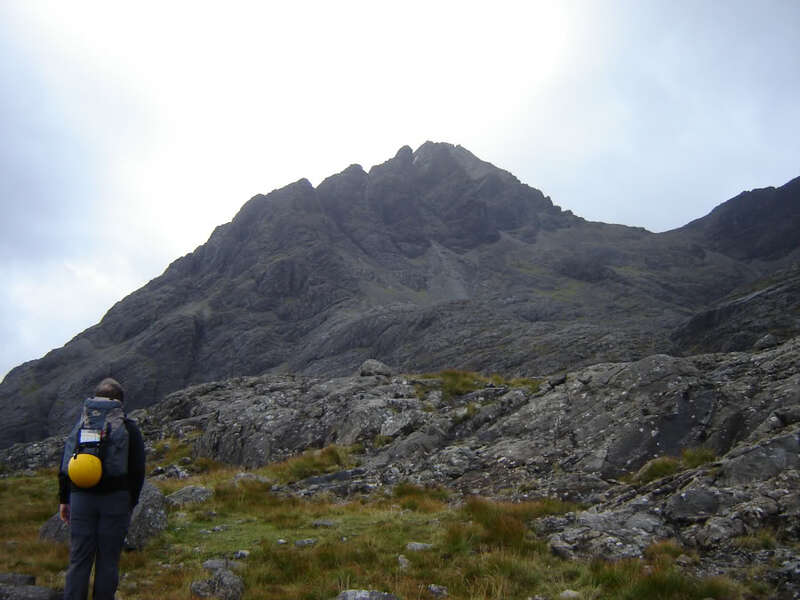 The guidebook suggests this section is Moderate so we decided to pitch it. I again led the pitch. 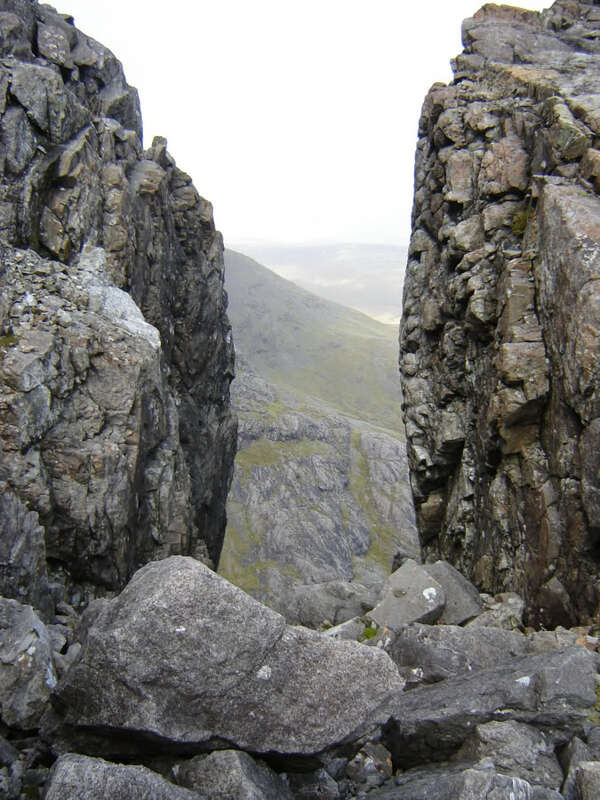 Between the gap and the prominent ledge there are only two awkward moves. 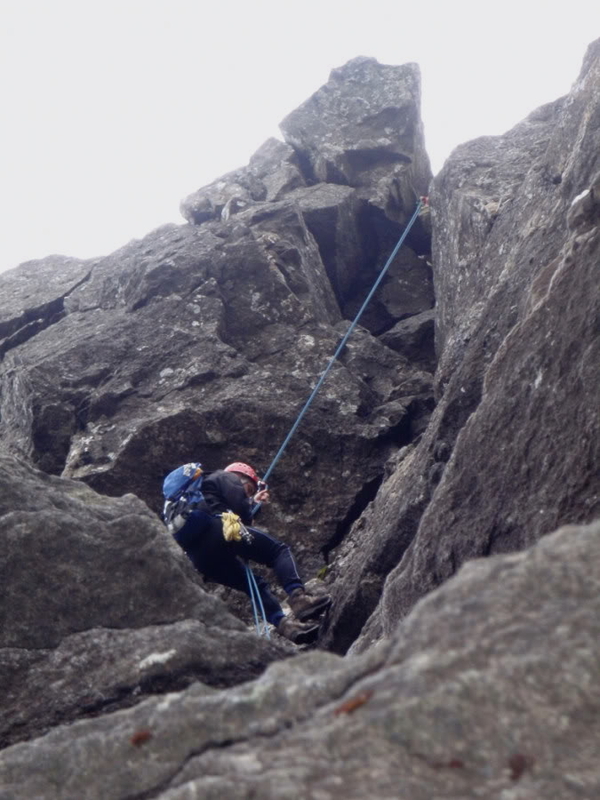 The very first awkward move involves reaching up for a high handhold above a slab. 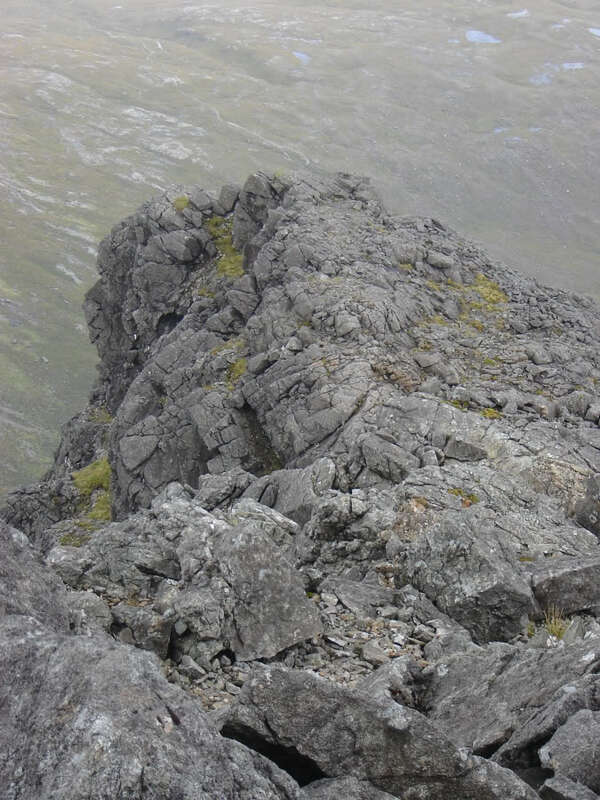 On reaching the ledge we again took coils and moved together as far as the top of Sgurr nan Gillean. 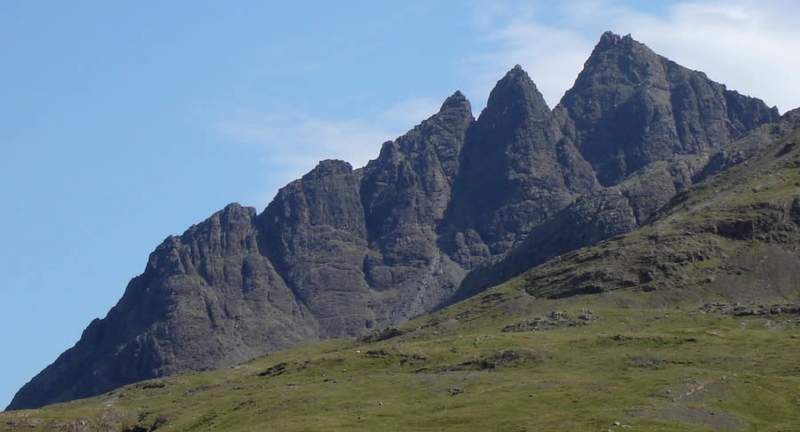 We followed the ledge that skirts Sgurr nan Gillean joining the West ridge above its chimneys. 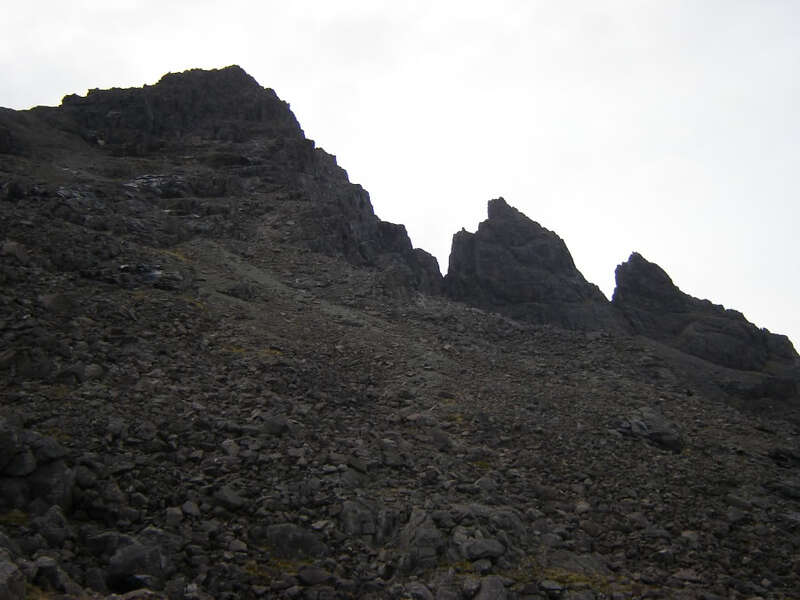 We then followed the remainder of the West ridge to the summit. 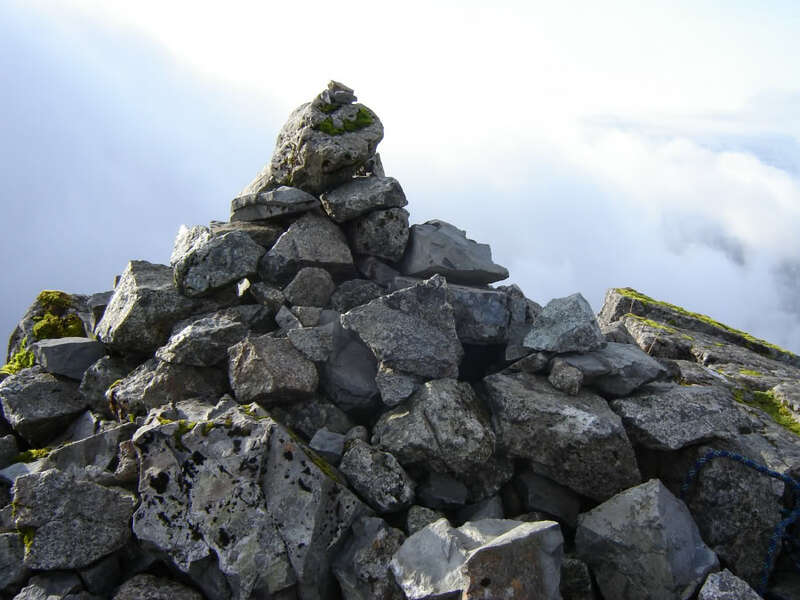 At the summit we took time to savour the views, have some much needed refreshments and pack away all the climbing gear. 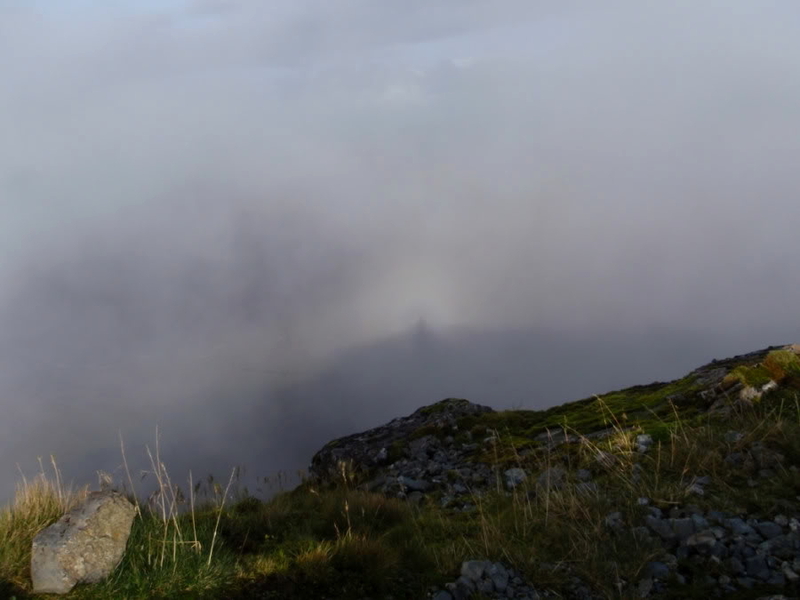 We were also treated to a Brocken spectre. We descended via the South-East ridge (the "Tourist" Route) which seemed really easy in comparison to what we had faced descending Knight’s Peak. 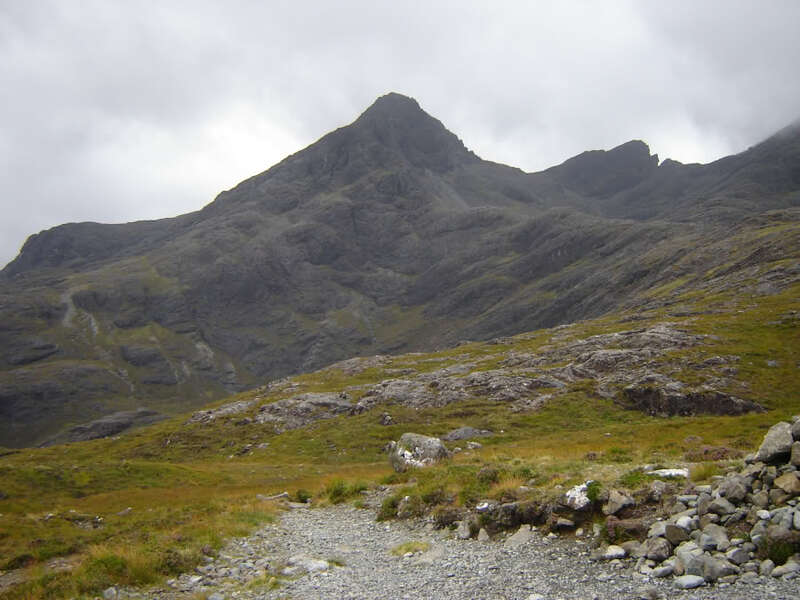 The walk out to Sligachan was pleasant. This was one of my best ever day’s out.